Good afternoon and Happy Tuesday! I'm getting so excited, this weekend coming is my first ever full day stamping retreat and I can not wait to spoil my stampers! It actually makes me giddy just thinking about it! Anyway, today I want to share a fun card with you, using the Dashing Deer bundle and the awesome background stamp, Buffalo Check. But what I think really steals the show here is the Swirls & Curls embossing folder! 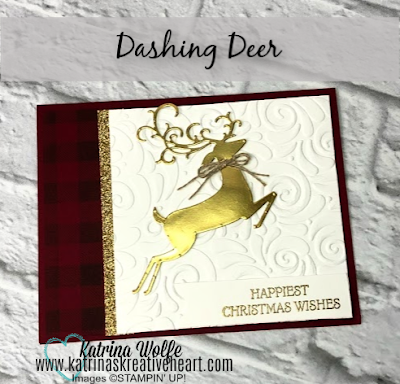 It came as a surprise really just how amazing this embossing folder is when I got the card all put together.